Meat giant Tyson Foods got its start in the early 1930s on Emma Street in downtown Springdale. The third Tyson family generation led by John Tyson, grandson of the founder, announced Thursday (Oct 8) that nearly 300 of Tyson’s corporate employees would be going home to work in what will be a new corporate office on the property at 319 E. Emma Ave, where the company’s original headquarters begin in downtown Springdale. Last summer Tyson Foods announced plans to relocate some of its corporate staff from the Johnson Road headquarters to downtown Springdale in an effort to put more feet on the street and support the city’s efforts to revitalize its downtown area. In January, Tyson Foods committed a $1 million to the Downtown Springdale Alliance to help jump-start the city’s revitalization efforts. Thursday morning a wrecking crew begin demolition on two buildings at 319 and 317 E. Emma Ave., the company’s original headquarters and the Brown Hatchery building next door also owned by Tyson Foods. Tyson said will soon begin construction on a new two-story, 44,000 square-foot structure behind and between the two older buildings, preserving the original frontage. He said Tyson will move about 250 of the corporate staff to the new building on Emma Street. And just a couple of blocks east on Emma in the former JTL Shops, which Tyson Foods purchased in January and is renovating, where another 75 corporate employees and the company’s employee store will be relocated. Tyson said his family are part in parcel with the city of Springdale. His grandfather John W. Tyson, moved his family to Springdale in 1931 during the depression. He said the family bought a small farm on Emma Avenue where they scratched out a living during the depression. Tyson Foods has grown into one of the nation’s largest 100 companies and the second largest food production company in the Fortune 500 with annual sales of $37.5 billion last year. “I have so many memories of Emma Avenue, running up and down the street as a kid, getting my hair cut across the street and today we are to plan the future with new hub or innovation,” Tyson said during the ceremony. 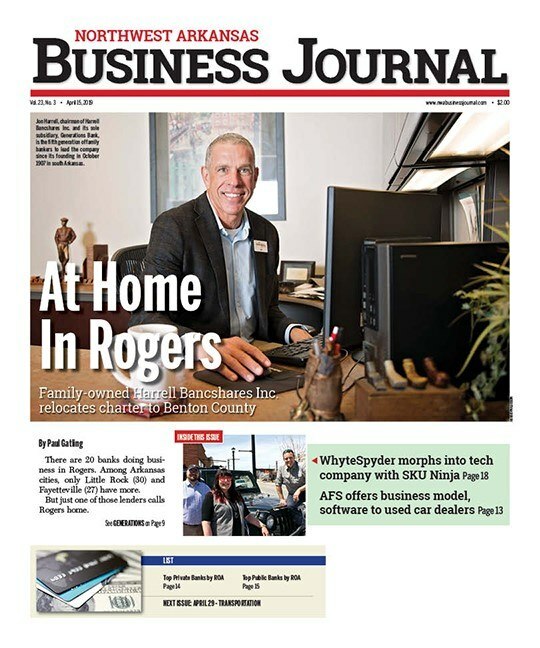 Perry Webb, CEO of the Springdale Chamber of Commerce, reflected on the first conversation he ever had with John Tyson after he and his dad Don Tyson had completed a meeting with Bernice Jones, founder of the Jones Center and co-founder of the Jones Trucking. “John told me that he had gotten chewed out by Bernice Jones for not doing enough to support downtown Springdale. Surely Bernice is looking down today and smiling on this news,” Webb said. Mayor Doug Sprouse said this day has been a long-time coming, but it is a “game changer and part of many good things to come.” He too, grew up in Springdale and said he made many memories that he refers to as the “good old days” in his hometown. “Today when I take my grandchildren to the taqueria or biking on the Razorback Greenway through Turnbow Park and Shiloh Square they are making memories of their own. We are building the foundation for what will be the ‘good old days’ for our future generations,” Sprouse said. He said the city’s master downtown plan for revitalization is a bold one. It will be revealed before long as the plan formation will soon be completed by St. Louis firm — H3 Studios. The city also worked with Daniel Hintz, former CEO of Downtown Bentonville Inc. on the plan design and features. “It’s going to take commitment from many others but it is Springdale’s plan with input from our local citizens who came out to the meetings and participated in the process. Getting more feet on the street downtown is crucial to the ongoing development of other businesses. We are so grateful to Tyson Foods and expect others will follow this lead,” Sprouse said. Carl George, a fourth-generation poultry executive for his family-owned business, George’s Inc., also spoke about the importance of preserving the rich history while also innovating for the future. George serves as president for Downtown Springdale Alliance and has been a supporter the city’s efforts to spruce up and energize its downtown. He said the vision his great-grandparents and grandparents had for Springdale was one of business innovation and commercial growth. “Today’s announcement is a huge step toward that vision. We know that getting people back on the streets is essential to future economic growth and revitalization of our hometown’s downtown,” George said.